I hope you enjoyed these 4 funky micro houses as much as I did. For me, it was the 2nd one because of the balconies. Well the Last one’s a little modern for us. The first one’s a little too quirky. 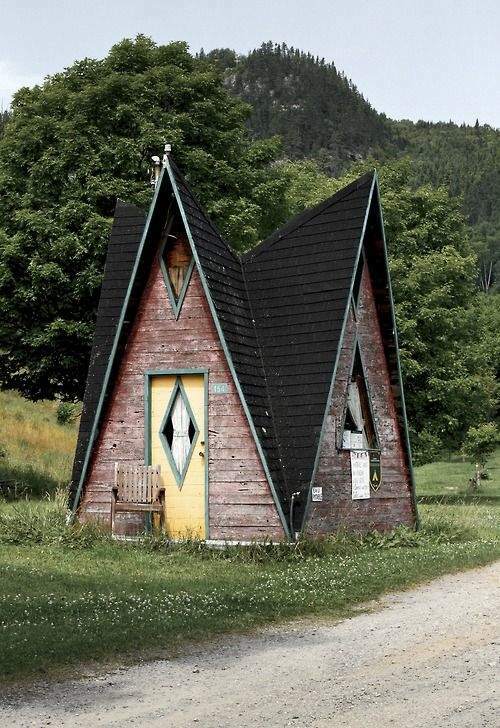 Not quite enough room in that little a-frame. So, I would have to go for the second one for the very same reasons you picked. I am still trying to figure out how to build a rooftop deck on my tiny house! Like that there are balconies but love that rooftop deck. Nice. I too like the second one best bang for the buck. Really like the roof deck. Not sure why so few are built as in a lot of places, especially those with mosquito’s, sitting high gets you up in the breeze and away from them and stay cool. I’d go a lift, a ladder like the bookcase one and a pole instead of stairs. Quite easy if illegal to build a lift. Though the same material/size in a single story would be better if you didn’t need height for the view. They are several ways to waterproof a flat deck but modern membraines made for it make it a breeze now. Just make the roof a little wider, a good amount wider in the south for more overhand to keep water off with just a degree or 2 of tilt to drain water but not enough to notice. Then build decking, rock in tar, etc on top to walk on. Another is boat fiberglass to waterproof. OKAY, I’ll follow the leaders. I, too am partial to #2 (Flickr) with #4 a distant 2d. Too many strangers and other folk would invade my peace, tranquility and privacy in a boat. # 4 is a kids playhouse. click on the “Dwell” link below the pic for the full image. Actually, none of these did anything for me… and as always, a floorplan helps, single photos don’t.